African Music Explorer #002 - Back in Africa! Finally! We're back in Africa! After five months in Switzerland it's just wonderful to be in Ghana again. The rainy season is over and it's getting very hot. But I'm glad I can escape Europe's cold and foggy November days. For a few minutes, a music video transfers you into the heart of Africa. Every month, I pick and post the coolest, most beautiful or interesting one I stumble upon for you to enjoy. Discover the romantic side of West Africa with graceful ladies and traditional customes in the green, lush vegetation of Southern Benin. Watch the video clip by Don Metok here. Enjoy! Support an African artist - Legally download a track! Through music, you can help Africa by just having fun. On African-Music-Safari.com I make it easy for you to find great tunes and show you the safe places to download them with direct links. Discover the romantic side of Benin with graceful African ladies and traditional customes in a green, lush setting. This month, we are remembering a beautiful woman: Mama Africa passed away one year ago. She collapsed on stage during a concert in Italy on November 10th, 2008. She was 76 years old. 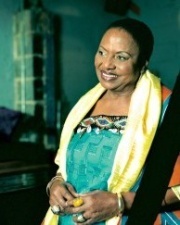 To honor her work, fans have started to share their favorite Miriam Makeba lyrics and videos. Why don't you join in and submit your own page? "Think of what has been accomplished to date: space exploration; satellite communications; heart transplants. Today, we have managed to do what previous generations never dreamed of. But, you see, today, around the world, 840 million people still don't have enough to eat. And it doesn't have to be this way." You can continue Miriam's fight for a world without hunger by supporting the FAO (Food and Agriculture Organisation of the United Nations). Have you ever heard of Ewe drumming? No?! Oh boy, you are missing out on one of West Africa's coolest drumming styles! But don't worry, next month you are going to find out all about it. Until then, keep the music alive! Feel free to forward this newsletter if your friends love African music as well. They can hop onto the Explorer on my sign up page. For real-time notification of updates to the site, subscribe to my blog's RSS feed and follow me on Twitter!